See Design Guidelines for Shared Public Ways below. Shared public ways should incorporate raised crossings across the alley entrance and special paving across the entire right-of-way wherever possible. provide clarity for people with visual impairments regarding the shared pedestrian/vehicular nature of the space. The character of a shared public way may vary, from quiet, residential-only lanes to mixed-use residential and pedestrian-oriented commercial streets with or without transit. Shared public ways may be designed with special paving, a variety of amenities, landscaping, and seating, and pockets of on-street parking, to create a safe environment that encourages public recreational use and socialization. They are especially valuable, and should be prioritized, in neighborhoods with limited opportunities for public open space. do not have transit service. On streets that do not meet all of these criteria, Shared public ways may still be appropriate pursuant to additional study and environmental review. Shared zone: the portion of the shared public way that is utilized by pedestrians, bicyclists and vehicles Shared public way: public right-of-ways designed for pedestrian use, and which also permits low volumes and speeds of vehicles and bicycles to share the open space. By definition and through design criteria, shared public ways are not hazardous vehicular areas. 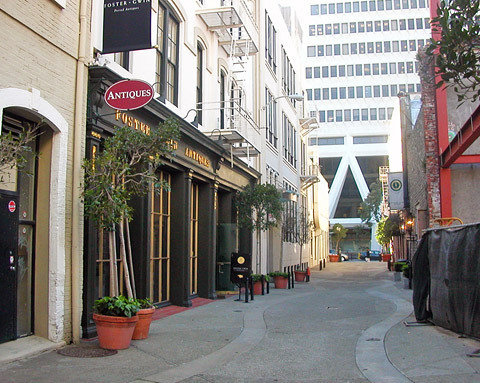 Shared public ways should be designed to emphasize their pedestrian and public open space character to differentiate them from traditional streets. On right-of-ways greater than 15 feet in width, shared public ways should include pedestrian-only zones as differentiated from a shared zone. The separate zones should be differentiated through the use of visual detectable cues as described below. Right-of-ways less than 15 feet in width do not need to differentiate between separate zones. Alternative paving materials patterns distinct from traditional streets. Paving should appear as an integrated, coherent design of patterns, materials, and colors. Paving textures should be smooth and vibration free. Where surface materials are coarse enough to impede wheelchair circulation, a continuous 4’ pedestrian path of ADA-compliant smooth materials must be provided to lessen vibration impacts on individuals using wheelchairs. See also Section 6.4. Small plazas or vehicle-free spaces adjacent to the shared zone that may alternate from side to side to create chicanes, or be interspersed among passenger loading zones, driveways or parking spaces. 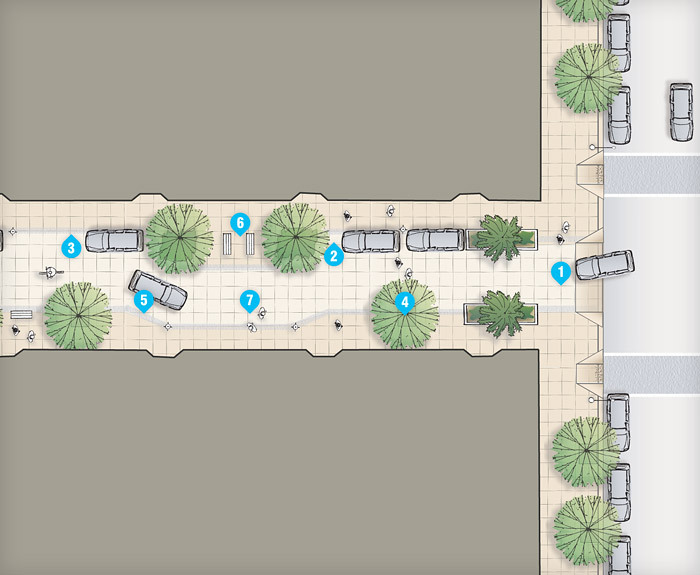 Landscaping, seating and other streetscape amenities or furniture located and spaced to allow visual permeability and barrier-free pedestrian movement through the entire shared public way even when vehicles are present. Vehicle closures on an intermittent or temporary basis for events, restaurant seating, markets, etc. temporary or movable objects, such as swinging gates, movable planter boxes or retractable bollards. Vertical materials or objects should have color or visual contrast with ground surface materials. Transit malls must provide detectable warnings (or other detectable element such as a curb, raised planter, or other architectural barrier) between pedestrian areas and public transit lanes (bus lanes, light rail tracks, and the like). Detectable warnings must comply with DPW standards for detectable materials. Where a shared public way leads to curbs, crosswalks and standard streets, curb ramps with detectable warnings must be provided. Shared public ways should utilize traffic control and calming strategies to slow traffic and emphasize the pedestrian nature of the space. On shared public ways, vehicles and bicyclists must yield to pedestrians. Shared public ways should have a posted speed limit of no more than 10 miles per hour. Gateways. Narrowing the entrance to the shared zone of the shared public way at the entrance from a standard street. Gateways may include flanking raised planters or vertical pylons or temporary element such as motorized gates or retractable bollards. They should not block crossing sidewalks. Driveway treatments. Raising the entrance to the shared public way to the level of adjacent sidewalks such that vehicles and bicycles must ascend a driveway apron to access the shared public way. Signage. Signage posting speed limits, instruction to yield to pedestrians and other information, such as name of the public space, or other signage indicating pedestrian priority. (Design considerations for signage should incorporate appropriate aesthetics that reflect the nature and character of the particular shared public way). Paving materials. Durable, textural material changes at the gateway to the shared public way, such as a band of rough cobblestones, storm drainage grates or textural material bands in pavement that provide a sense of low vibration when a vehicle drives over the material. Color and material contrast (light on dark, dark on light) can also distinguish changes between a standard street and the shared public way and send a cue to drivers that they are in a pedestrian-priority space and must slow down. Chicanes. Introducing serpentine pathways for vehicle and bicycle travel, employing horizontal shifts (chicanes) through placement of landscaping, bollards, street furniture, parking, and other streetscape elements, while preserving unencumbered pedestrian travel. Shared public ways may or may not be accepted for maintenance and liability by the City and County of San Francisco. Responsibility for maintenance of all zones of shared public ways should be determined prior to approval of a shared public way. Design of shared public ways should solicit public input on a project by project basis, including participation and input by individuals with disabilities and groups that represent individuals with disabilities, including people with visual impairments. Primary access to large shared or common garages should be located away from shared public ways and onto alleys or streets designed for more regular automobile use wherever possible. Shared public ways should be designed to drain away from buildings, either toward the center of the street, with a side-running gutter on either edge of the central space, or to other stormwater drainage features. See Stormwater Overview. Visual/tactile cues may serve the specific needs of individuals with different types of disabilities. Visual cues serve individuals with low vision. Tactile cues may serve as means for wayfinding as a cane-detectable edge, “shoreline” or pathing. The type and use of treatments is dependant upon the context and uses which may occur in the shared public way. The use, design and placement of visual/tactile cues should permit effortless permeability of pedestrian circulation between pedestrian-only zones and shared zones. The spacing of vertical objects may serve to prohibit vehicles from entering pedestrian-only zones or other open space plazas or park areas. The placement of vertical and/or caning detectable materials should be aligned to reinforce edges and “shoreline” path markings. 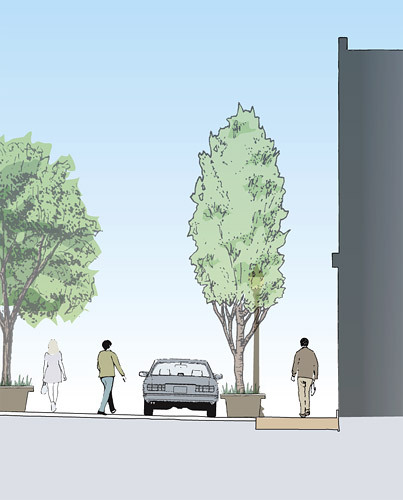 The spacing of these vertical objects should allow for continuous and unencumbered pedestrian movement along a shared zone even when vehicles are present, and support the overall use of the shared public way as usable open space. Per California Building Code (Section 1133B.8.5), if a walk crosses or adjoins hazardous vehicular areas, and the walking surfaces are not separated by curbs, railings or other elements between pedestrian areas and vehicular areas, the boundary between the areas shall be defined by a continuous detectable warning which is 36 inches minimum wide and complying to DPW and State of California technical standard. As noted in definitions, shared public ways are not hazardous vehicular areas, and contain restrictions that mitigate this issue. Curb ramps with detectable warnings are required at pedestrian crossings that intersect raised curbs, if adjacent to hazardous vehicular areas (standard streets).